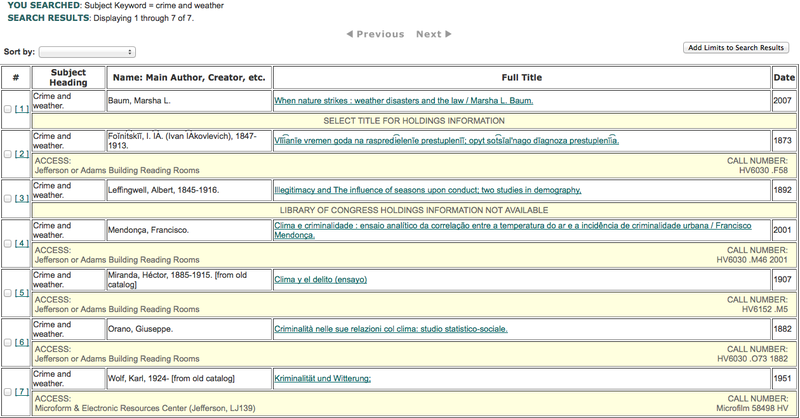 ← Metadata projects in three easy steps : where to begin? 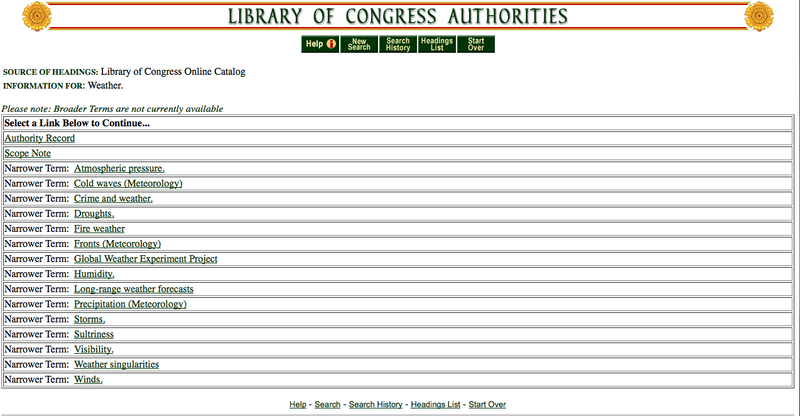 First off, I’m very happy to share that I am now the Metadata and eResources Librarian for OhioLINK! My first day was today…although OSU cancelled classes and so the office, too, had a snow day, which got me thinking about weather and storm-related subject headings. It’s an area I’ve not looked into before and there are a lot of interesting findings in that nook of the LCSH. A huge storm blew down from Canada into the States and while we did not get dumped on with snow in Columbus, below freezing temperatures and gusty winds kept many people home from work and school. 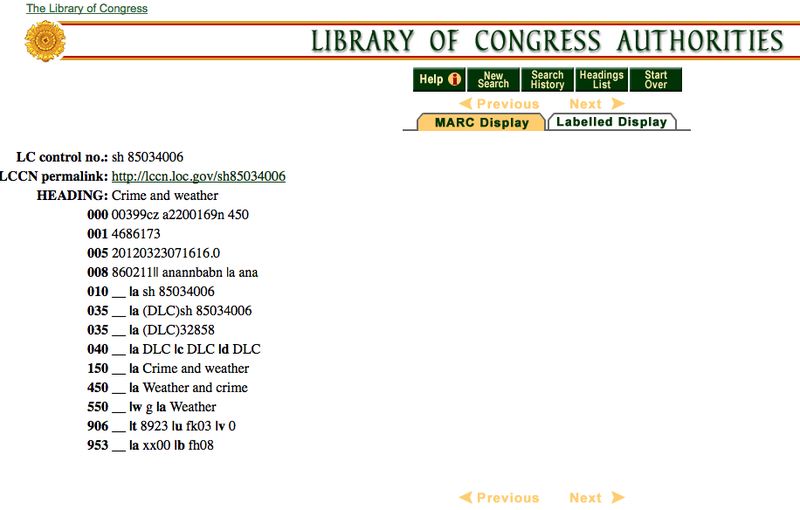 This is a basic authority record, without any additional information of interest that sometimes shows up. It’s always good to go into a record and related records, since that can truly help figure out where a tricky work should be placed and how to describe it best. We only get the broader term of weather, which lead us here, in the 550 field. 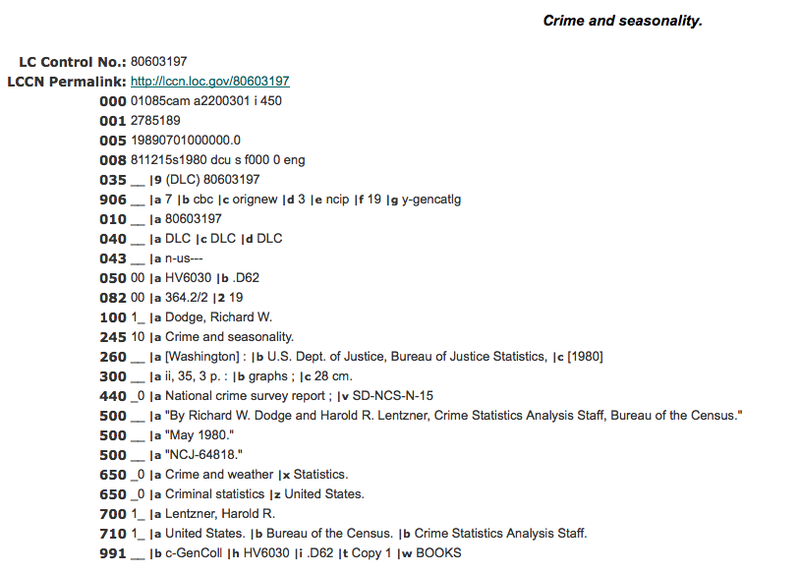 Unfortunately, there aren’t many works with the subject heading crime and weather but there is a statistics subdivision, which begins to piece things together for me. It jogs my memory about hearing news reports that hot weather in New York City makes people commit more crimes…sweltering weather leads to hot tempers, I recall. The previous linked article and the following one do agree that it is in fact extreme temperatures that encourage more crime, although it can’t be too hot. Let’s see those eight results. I want to know more; perhaps I watch too many crimes shows and movies. 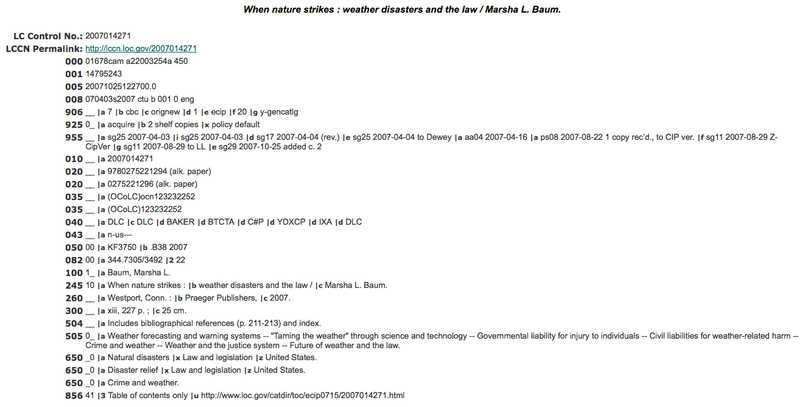 This first work concerns the legality of how weather affects and harms people as well as how to prevent and deal with the ramifications of weather and people’s actions cause by weather. If I were at the Law Library, I’d love to go grab this from the shelf and thumb through it! In contrast to the other work, this one takes crime and weather into a much more specific realm concerning illegitimacy. It is crucial to note the order of the subject headings, which traditionally classify the work (i.e. 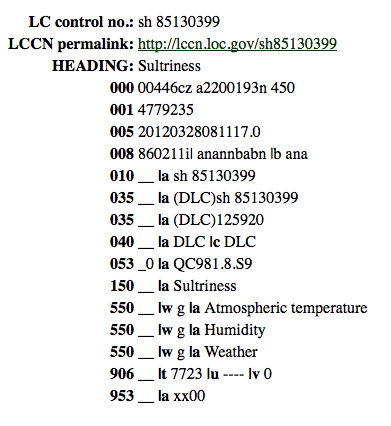 give a call number/place on the shelf) under the first listed subject heading. As I wrap up, there is now word that OSU is closed Tuesday as well. Perhaps my book blog will get updated tomorrow! Stay warm and safe, no matter where you are, especially Minnesota and North Dakota where it is even worse and I have family. Amazing and relevant research: Do robbers back off with Polar vortexes? Yes! It’s too extreme for even the baddest baddies.